Wendy and entire family drive us and Zoe to the Atlanta airport. 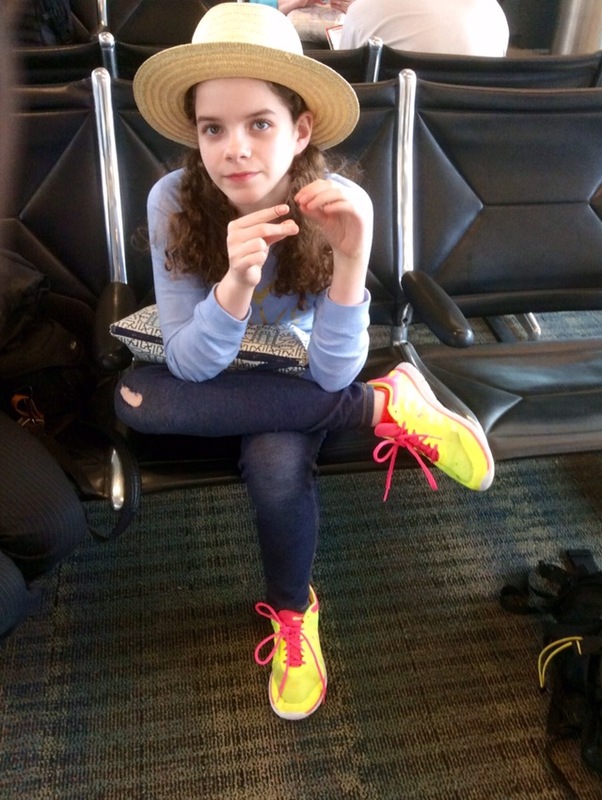 Phoebe is flying with us to DC, because she’s been invited to DC to spend a week visiting her cousins Jasper and Riley at Aunt Jodi and Uncle Robby’s house. Not Africa, but a nice consolation prize. Drop off and security went smoothly, except that Carol’s boarding pass got rejected, so she had to go back to the counter and we got separated and had to meet up at the gate. Zoe was missing a plug that would permit her to download photos from her camera to the iPad. Fortunately, though, there’s an Apple Store in the Atlanta airport so that we were able to buy the plug. Flew to Dulles, where Aunt Jodi met us at the gate. We stopped for a bite at a restaurant, and Jodi left for home with Phoebe. 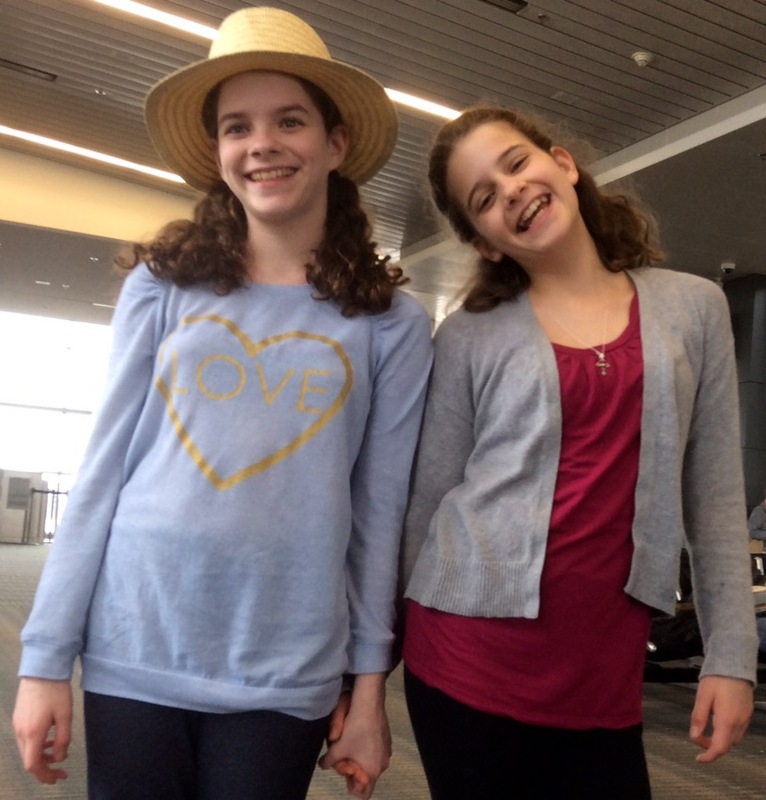 Here are the sisters at Dulles, and a photo of Zoe, as the well-dressed traveler to Africa. Zoe, Carol and I killed about three hours at Dulles, charging devices and the like, before we boarded our flight to Africa. Now, in the abstract, a trip to South Africa and Malawi sounds pretty romantic, and it is. There are, however, some decidedly non-romantic elements, such as the twenty-five hours that will have elapsed from sallying forth for the Atlanta airport and landing in Johannesburg. The flight from Dulles is about 17 hours, with an hour layover in Dakar, Senegal, during which we’ll remain on the plane. Of course, I expect no sympathy, given the payoff at the other end, and the fact that I get to ride with Zoe in the seat next to me. On the flight I have already finished reading The Rosie Effect, the very charming and funny sequel to The Rosie Project, and I’ll start The Soft Vengeance of a Freedom Fighter by Albie Sachs, a former justice of the South African Constitutional Court, about whom you’ll hear more later in the trip. And, then, there’s blogging and trying (almost certainly unsuccessfully) to sleep. May try a movie or two, as well. Carol and I travelled to South Africa thirteen years ago, with our friends Judd and Linda Miner, Bob Bennett and Harriet Trop. On that trip, we also visited Botswana and Zambia. Africa had always seemed the dream trip to Carol and me, and it was. That trip may still be our favorite ever. We assumed, at the time, that it would be our one and only trip to Africa. It hasn’t quite turned out that way. In fact, this trip is our eleventh and, in addition to the countries we saw on our first trip, we’ve visited Kenya (twice), Uganda, Tanzania, Egypt, Ghana (five times), Nigeria (twice) and Namibia. On this trip, we’ll add Malawi and, possibly, Mozambique. We could legitimately add Morocco (and a twelfth trip) to the list, since we went there for eight days in 1967. You could say that we’re a bit drawn to Africa. Finished Albie Sach’s book and saw a pretty cute Will Ferrel movie. Played a bunch of video games with Zoe on her iPad and lost badly. I think she may be cheating, though I haven’t figured out how. After clearing customs in Joburg, which was quite slow because of inadequate staff, we were met by our driver/guide, Freedom Dube, who Carol and I had met on our trip to Namibia last year. Freedom drove us to the hotel, the Southern Sun near OR Tambo International Airport, and helped us with check in. Our room is quite adequate, as was our dinner at the hotel. Back to the room to blog, email, shower and retire early, exhausted from the long trip. Tomorrow, we start in earnest. LOVE all the detail I managed to get from your post! Thanks for the update! Have a good sleep! And then what happened?! Ready for the next installment . . . Loved reading the blog. Felt like I was right there. Photos of the girls are wonderful. They are so adorable.